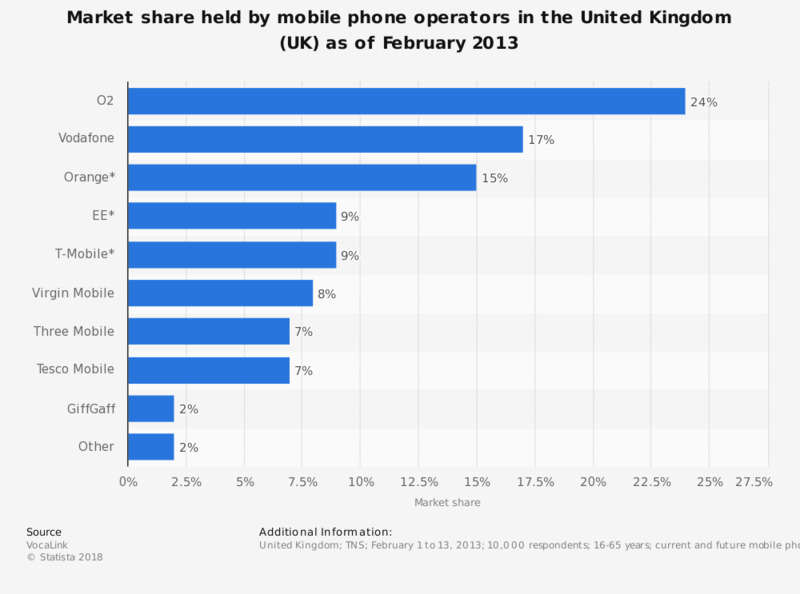 This statistic shows the market shares held by mobile phone operators in the United Kingdom (UK) in 2013. It was O2 that held the greatest share of the market - 24 percent. Despite that Everything Everywhere, owner of the brands Orange, EE and T-Mobile, accounted for a combined market share of 32 percent. O2 was not only the operator with the highest market share, but also the operator with the most mobile virtual network (MVNO) subscribers. Vodafone, however, has the majority of its customer satisfied. The telecommunications market is ever changing, and there are many things occurring in the business world that customer don't necessarily pay attention to. For example, although O2 still operates under its name it was purchased by Telefónica in 2006 for a total of 18 billion British pounds. Telefónica is the one of the leading mobile operators worldwide, along with China Mobile, Verizon Wireless, At&T Group, Vodafone, Softbank, and Deutsche Telekom (T-mobile). * The brands Orange, EE and T-Mobile are owned by the network provider Everything Everywhere. Everything Everywhere accounts for 32 percent of the market.